Photo: Professor Torgny Näsholm receiving the 2018 Marcus Wallenberg Prize from the hands of King Carl XVI Gustaf. Photo: Johan Gunséus. Professor Torgny Näsholm, the Swedish University of Agricultural Sciences, Umea, Sweden, has examined the role of amino acids in supplying the nitrogen required for the growth of forest trees. His work has caused a breakthrough in explaining the nutrition of plants. For his discoveries Torgny Näsholm has been awarded the 2018 Marcus Wallenberg Prize. He received his diploma from the hands of His Majesty the King of Sweden at a ceremony in Stockholm, Sweden, Monday 24 September 2018. The ability of boreal forests to take up atmospheric carbon dioxide and produce wood depends on the availability of nitrogen in the soil. The growth of most forests is however limited by a low supply of nitrogen. Some species have developed symbioses with bacteria that can process nitrogen gas into amino acids. More than a century ago some plants were demonstrated to have the capability of taking up amino acids directly. The process was not considered important until the isotopic methods were further developed and could simplify chemical analyses of different elements. Torgny Näsholm has in different studies since 1998 investigated the nutrition of forest trees – particularly Scots pine and Norway spruce. He found that nitrogen from amino acids was taken up by tree seedlings and discovered that the amino acid concentrations in forest soils are high enough to provide a substantial supply for tree uptake. He could also testify that the major nitrogen source of pine and spruce in boreal forests is amino acids rather than ammonium ions or nitrate. The new insights inspired Torgny Näsholm to develop fertilizers based on amino acids. Field studies revealed the improvement of shoot and root growth when seedlings were grown on this organic nitrogen source. Leaching of nitrogen during seedling cultivation in nurseries was also reduced significantly compared to conventional inorganic fertilizers. The findings have had an impact on nursery and forestry practices in coniferous forests in the Nordic countries. The first patent for this approach was issued in 2000 and a fertilizer called Argrow, based on the amino acid arginine, was introduced on the market. Arginine is a nitrogen rich amino acid that is rapidly absorbed by plants. The fertilizer is mainly used in forest nurseries in Sweden, and tests have been performed in Finland, USA, Canada, Uruguay, China, New Zealand and Australia. It is also being tested on other commercial crops and garden plants. The innovation has been further developed and a new category of patented, slow release fertilizer based on arginine is currently being tested in large scale field trials in Finland and Sweden. The results are very promising, according to Torgny Näsholm. Seedpad is an example of another new technology for improved germination of pine and spruce seeds, that Arevo AB, Umea, Sweden recently developed. Torgny Näsholm is the CEO for this company. 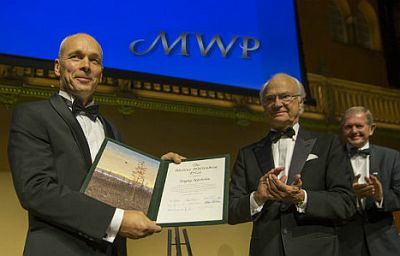 Marcus Wallenberg, chairman of the Marcus Wallenberg Foundation, stated that Torgny Näsholm’s research findings have led to a paradigm shift in the understanding of the ecosystem in forest trees. He has also developed effective and environmentally friendly fertilizers, Marcus Wallenberg said. King Carl XVI Gustaf, Queen Silvia and 350 other guests from several countries were invited to the prize ceremony and banquet at the Grand Hôtel, Stockholm. A group of 32 junior scientists participating in an extended Young Researcher’s Program during four days in the Swedish capital also enjoyed the evening.